Gourmia Dual Grill Just $56.99! Down From $120! PLUS FREE Shipping! You are here: Home / Great Deals / Amazon Deals / Gourmia Dual Grill Just $56.99! Down From $120! PLUS FREE Shipping! Head over to Amazon to score this Gourmia Dual Indoor Grill for just $56.99 down from $119.99 PLUS FREE shipping! If you love hot, smoky, barbecue flavor, but don’t want the inconvenience of an outdoor grill, the Fold-A-Grill is for you. This endlessly versatile cooking companion helps you grill your favorite meats, poultry, fish, vegetables, and more in an instant. 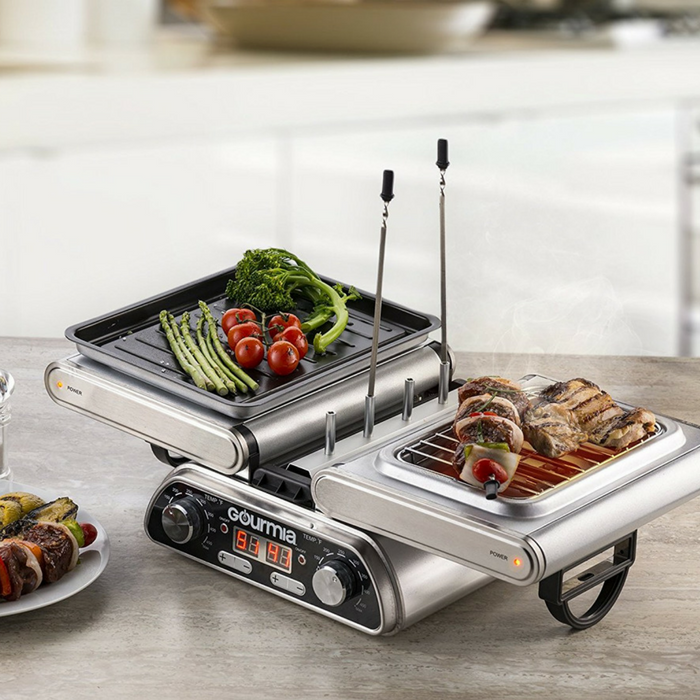 Be the ultimate culinary wizard with the 10-in-1 FoldAGrill–the grilling machine you can’t cook without! This machine can grill, boil and sear. Use it for steaks, beef, pork chops or chicken wings. Cook fish, seafood, breads and paninis, vegetables, chilis and stews, or shrimp, kabobs, and stir fries. You can even cook eggs and bacon, dips, fondues. and so much more! DUAL DIGITAL GRILL: Grill multiple foods at different temperatures simultaneously with this digitally controlled innovative dual grill. Sauté on one side while grilling on the other. DOUBLE SIDED STEAK: No need to flip the meat anymore! Place food in the automatic spring adjustable basket, and fold up each grill side for quick, double sided results! EXPANDED ACCESSORIES: Includes everything a master chef needs. Vertical grill basket for BBQ chicken wings & more, skewers & stand for kebobs, sauté pans and more. INCLUDES COOKBOOK & USER MANUAL: Skillfully cook all types of delicious meals with this state of the art grill! We provided a cookbook & user manual to get you up & running in no time!